The Coping Kit Smartphone App is coming soon. The Coping Kit brings The Coping Kete to your Android Smartphone with a bunch of extra features that make it easier to change the way you cope with stress and distress. Build a virtual Coping Kit on your phone and carry it with you wherever you go. Simple and discreet; from now on, getting help to cope, looks a lot like checking your messages. The Archive: The entire Coping Kete archive on your smartphone. The Test Kit: It is much easier to shift distress with actions and ideas we are familiar with. Save strategies from the archive to your Test Kit and build a list of strategies you want to experiment with. Schedule practice point reminders using your phone calendar function and set up your own personal development programme. Your Personal Kit: Add familiar and favourite strategies to your Personal Kit for times of stress and distress. Coping Shortcut Button: When times are tough, hit your Coping Shortcut Button to display a random favourite from your Personal Kit. Ad-Free: The Coping Kit App is an ad-free space where you can explore your mental health without being marketed at. Browse Categories: Self-soothing, mindful distraction, expression and support, and engagement. Automatic Updates: A new strategy is added 1-2 times a month and you’ll never miss a thing. Get Coping Info: Link to the website to read coping information and the App User Guide. 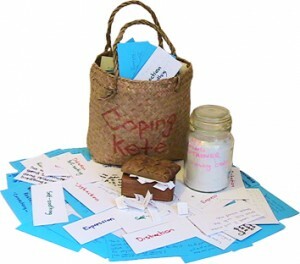 Created by Engage Resources Ltd, The Coping Kit App will be available through the Google Play App Store for NZD $1.39. 25 cents from every sale will be donated to CMHRT’s charitable mental-health initiative, Engage Aotearoa.